Here’s my Great Great Grandfather Alban Boring (far left, white hair) along with my Great Uncle, his grandson, Cecil Boring (4th from the left, standing like a lumberjack). 1912. Logging with horse power and then making lumber with steam power (I think!?!) … that’s labor to celebrate. Little Girl, back when she was a Little Girl. Little Girl said something important today. Little Girl isn’t so little these days … she’s home from college now, and working at a day care business here in Santa Clarita. She’s now in charge of the kindergarten; a promotion she recently earned. My Little Girl is doing very well these days. Her kindergarteners don’t call her Little Girl, but I do. And I always will. In her room at the day care, she decorates the walls with a variety of stuff. She’s got a “me display” that includes pictures of her family. There’s a picture of her niece, Payton, among others. Little Girl relayed a conversation she had with a kindergartener in her charge, and it brought a smile to my face. Twice. My Little Girl: That’s my boyfriend, Eric. My Little Girl: No, we’re not married. Kindergartener: But you have a baby? You can’t have a baby if you’re not married. My Little Girl: No, that’s not my baby. That’s Payton, she’s my niece. She’s my brother’s baby. Kindergartener: Oh…. You have a brother? My Little Girl: I have two brothers and two sisters. Kindergartener: You have two brothers and two sisters?!!?? My Little Girl: Well, my two brothers are both married. And their wives are my sisters-in-law. They are my sisters. OK, so I love this Kindergartener. Can’t have a baby if you’re not married? Love it. The big idea here, though, is Little Girl describing her relationship with her sisters-in-law. They are sisters. They were all 3 in the weddings for the 2 that are married, and I’m sure that Lauren will have her sisters in her wedding (whenever that might happen). Isn’t that the way that it should be? 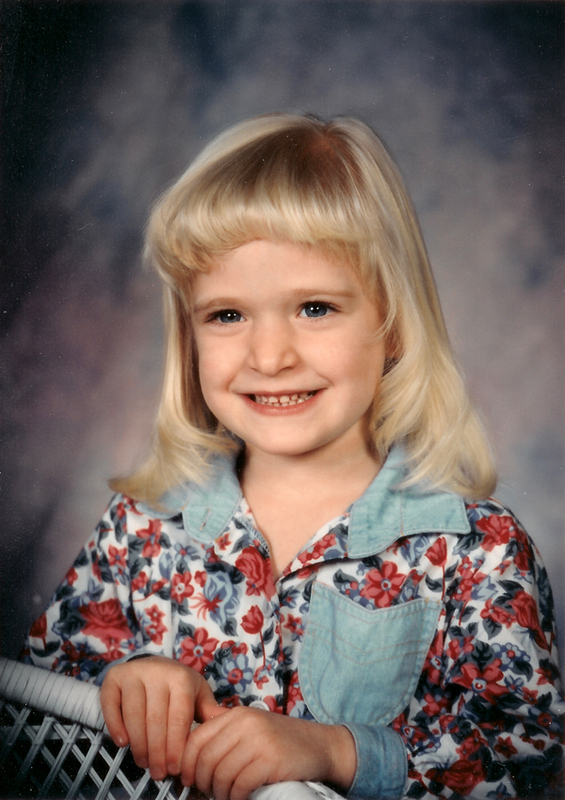 Here’s Little Girl … the blonde! 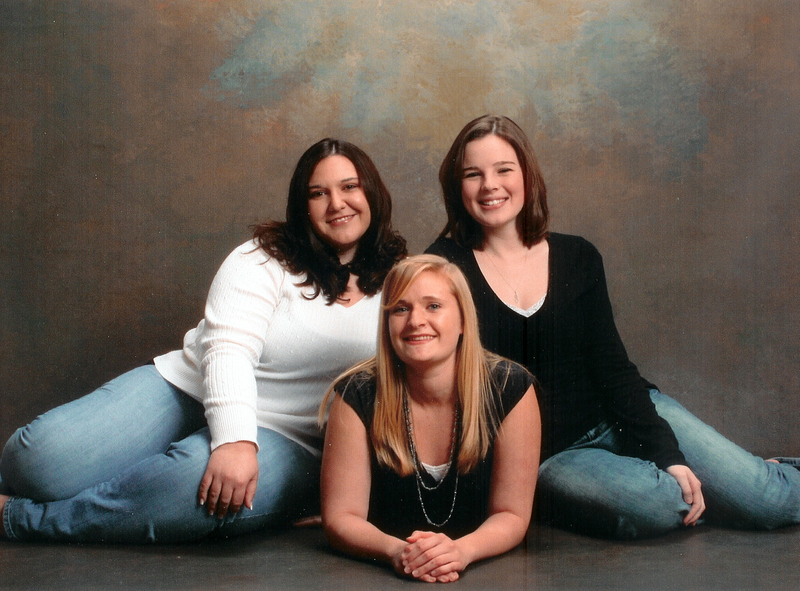 … and her two sisters. That’s the very important mother of my Granddaughter on the left, and MrsMowry on the right. 2006. A database of Missouri’s original land purchasers is now available online. Land purchases are shown from 1831 – 1969. This land was originally donated to the state by the federal government, with the proviso that it be sold to settlers for $1.25 per acre. Profits from the sales went to the state. 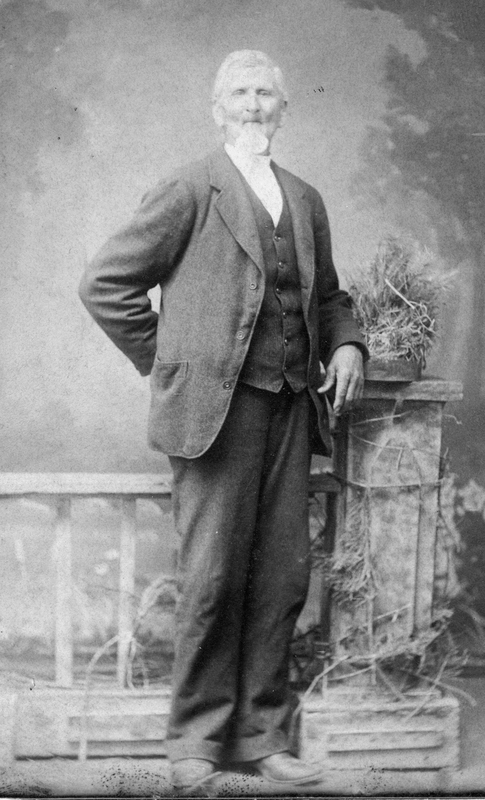 Noah Mast, my Great Great Great Grand Uncle (!) 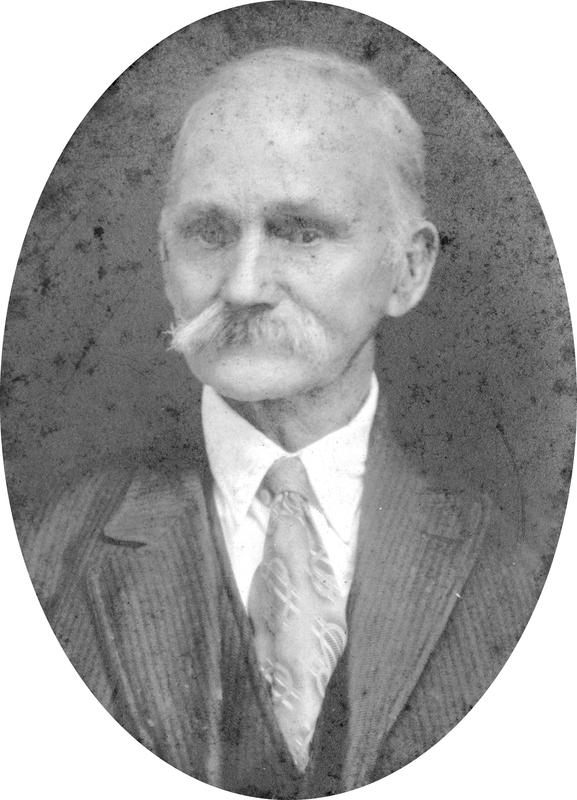 was one of those purchasers … in 1850 he bought 195 acres in Nodaway County for the princely sum of $244. This easy to use database is available here. You can order a copy of any land patents for a dollar and a self-addressed envelope with each request. This picture of Noah is one of the oldest in our family collection; it’s from a tintype. Tintypes were commonly used circa 1860-1880. 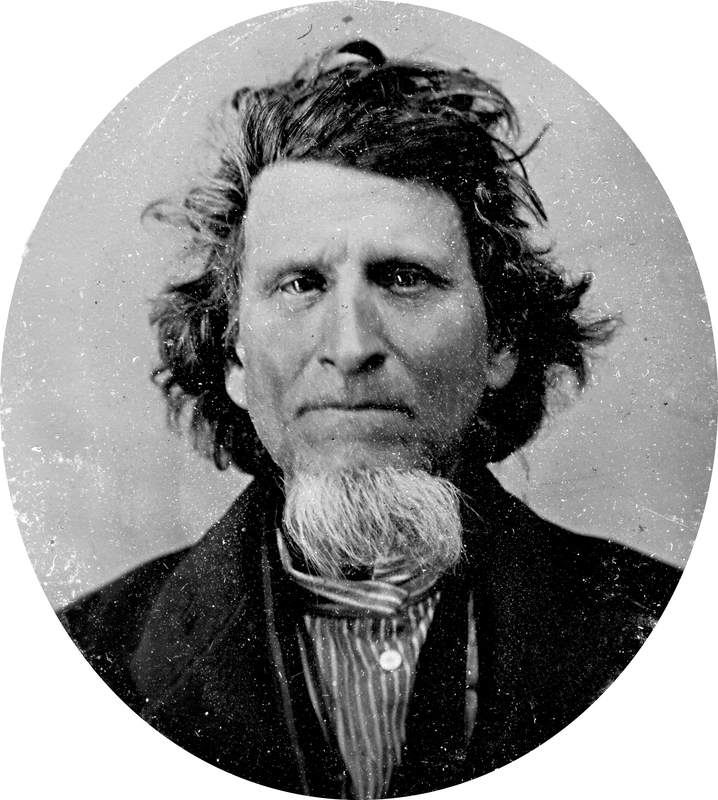 Noah Mast, 1812 – 1897, gentleman farmer and owner of a comb later in life. Yesterday, I wrote about how people become citizens today. My newly found cousin, Robyn, reminded me that our ancestor took a somewhat different route to citizenship. 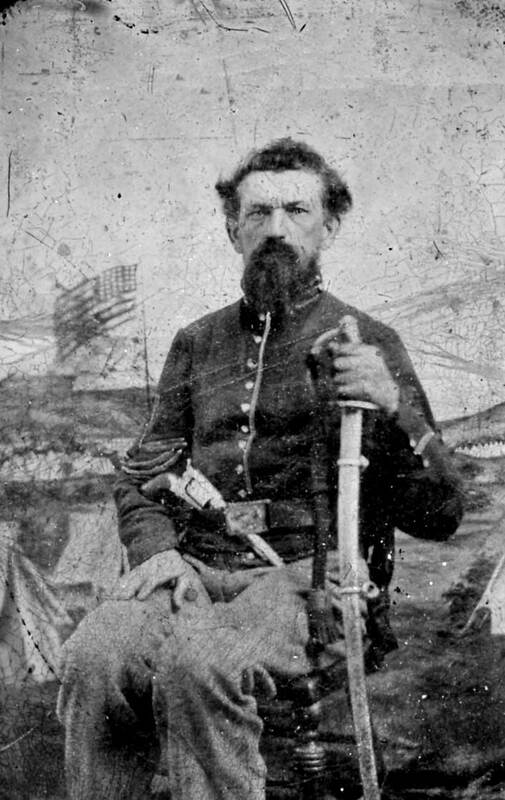 Phillip Patterson Shull, our Great Great Grandfather, served in the 37th North Carolina Company E, Lane’s Brigade, Wilcox Division, Army of North Virginia, under Generals Robert E Lee and Thomas “Stonewall” Jackson. Yes, my Great Great Grandfather – known by his family as “PP” Shull – was a member of the Confederate Army. He enlisted at the age of 19, and served 1861 – 1865 as a private. We don’t know much about his service, but we do know that he was captured in 1865, and became a prisoner of war. On May 29, 1865, President Andrew Johnson signed an executive order for amnesty for the POWs who would take an oath of allegiance. This is the script for the Oath required of POWs that desired their freedom. My mother still has the original, nearly 150 years later. On June 20th, Phillip P Shull took that oath. We have no evidence that our ancestor ever owned slaves, but with this oath, he swore that he would not own slaves in the future. 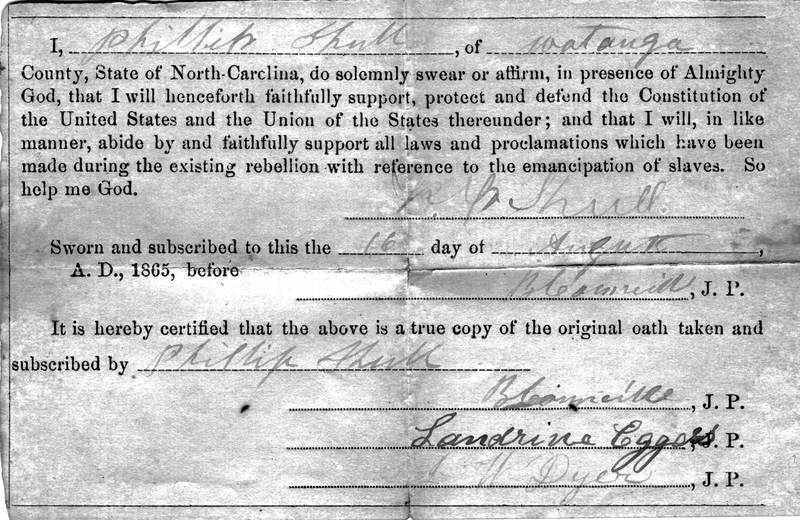 On August 16, 1865, Phillip again swore his allegiance to the United States of America, and this was confirmed by three signatories in Watauga County, North Carolina. As a fine upstanding citizen of the United States of America, Phillip left North Carolina and moved to Skidmore, MO. 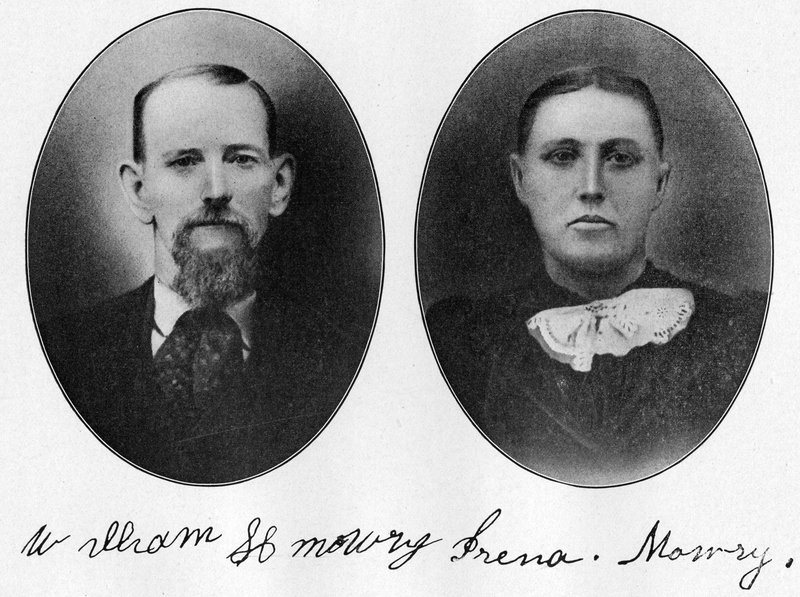 He eventually married Martha Ellen Mast, and they raised 8 children. 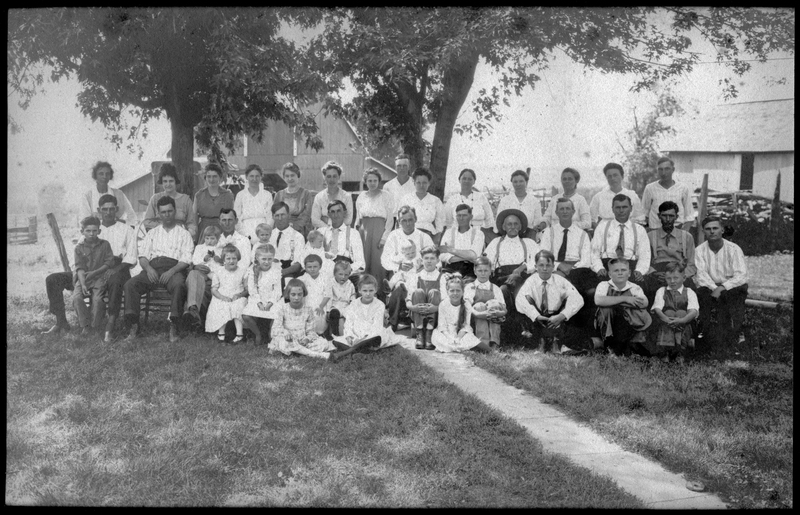 Here’s the Shull family reunion, circa 1920. There are 3 generations in this photo. My grandfather, whom I’m named for, is in the front row, 2nd from the right: Lee Shull. My Great Grandfather, Artemus Shull, is seated, 3rd from the right. PP Shull, my Great Great Grandfather and former confederate soldier, is seated, wearing a hat, 5th from the right. His wife, my Great Great Grandmother Martha Ellen Mast Shull, is standing behind him, 4th from the right. My Great Great Grandfather Baugher wore a chain on his vest, with his retractable brass toothpick attached. It’s a scary looking thing. The toothpick, I mean. This painting was done by my Great Great Aunt Alma Shull Parsons, and was given to my Mother and Father as a wedding present. It’ll never hang in a museum, but what a treasure! 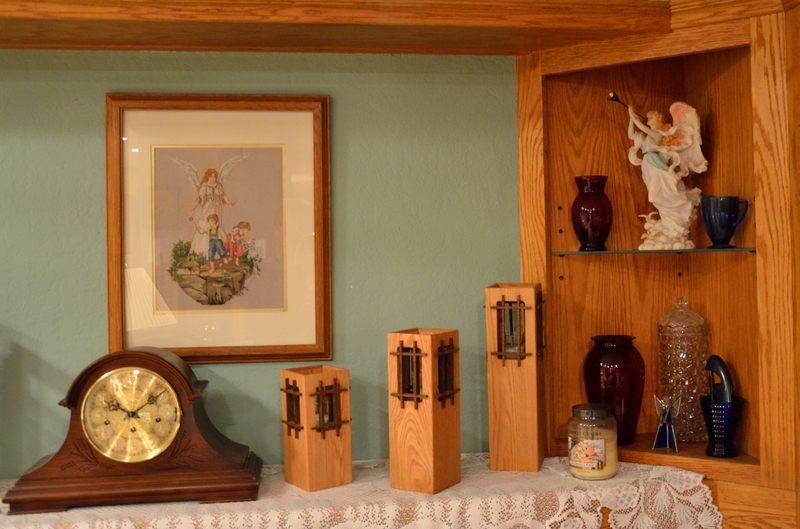 The last time I visited Mom, we agreed that my next visit would include a session where we identified family heirlooms. Mom would tell the story. Sis would write the description. I’d take a picture, and then I’d combine those elements into one document. That way, we would always know what’s what, and what belonged to whom. Simple, yes? Not really. You’ve got to find the time. I live 1,800 miles away. Sis is 200 miles away. Not. Simple. At long last, the planets had aligned and we were ready. Mom proceeded to trot out a diverse lot of, uh, stuff. Let me be clear that we’re not talking about items with a high dollar value. We are talking about stuff that had been handed down from previous generations … like a brass toothpick owned by my Great Great Grandfather. Things that no one outside of my family would ever care about! But, oh my, what stuff Mom has! I was amazed at how much I learned. You see, I’ve sat around Mom’s dinner table and talked about our ancestors. She’s got books and books and 3-ring notebooks of pictures and written records and birth certificates and service records and … STUFF … that we have discussed for hours. We’ve got the family pictures and family tree documentation pretty well in hand (I hope). Now, however, we’re learning about physical objects that rarely see the light of day … and now our entire family gets to know their story! Pictures of my two favorite items are below. As you can see, it’s not about the monetary value, it’s about the family stories. The only way for you to capture those — the ONLY way — is to talk to your family members about what they know while you still have access to them. You never know when you’ll move away, or they’ll move away, or tragedy will strike and communication just won’t be possible anymore. Find the opportunity to talk to your family members about what they know. You’ll find that the old stuff that’s lying around just might take on a whole new meaning for you when you know the history of each item! 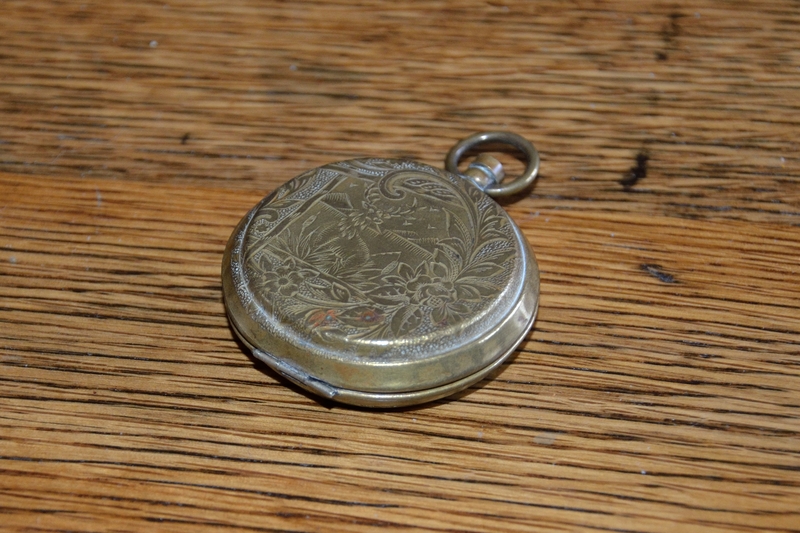 Pocket watch? Not from my family! 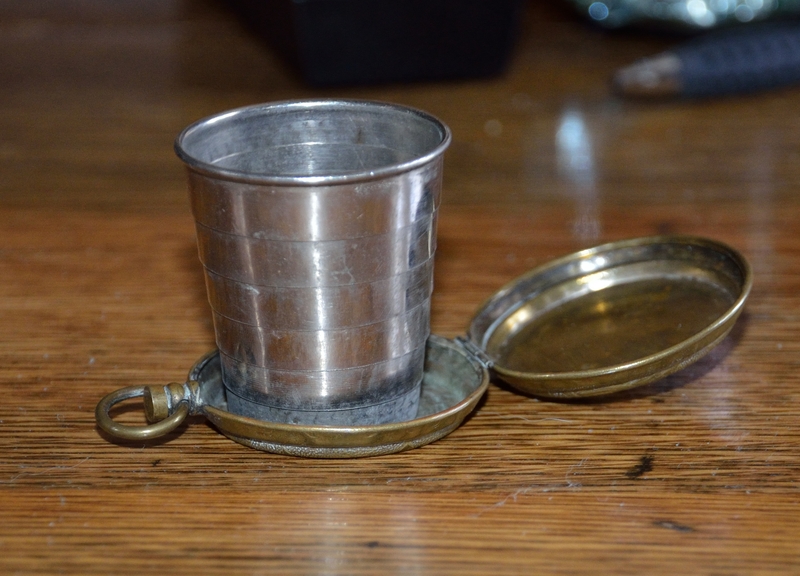 This collapsible pocket shot glass was handed down, but we don’t know who owned it originally. Alas … but it sure does illuminate a fun heritage! This graphic of a guardian angel (sorry for the poor photograph!) hung in the home of my Great Grandparents, James Woods and Matilda Rebecca Swartz Decker. It now hangs in Mom’s home. 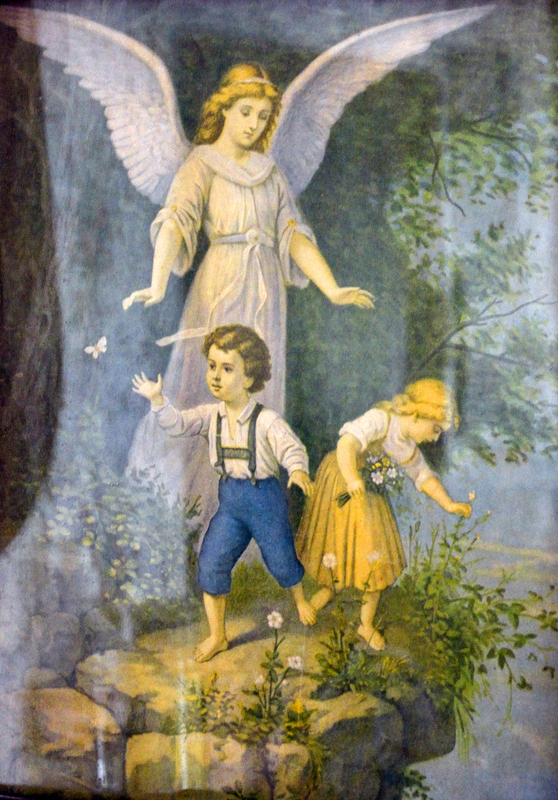 Knowing Velda’s love of angels, Mom made this counted cross stitch of a Guardian Angel for Velda years ago, and it’s hung in our home since. I didn’t understand it was the same image as the one that hung in my Great Grandparents’ home until Mom told me last week!